St. Francis, spring Island, SC. The statue of St. Francis stands in peaceful splendour at the end of an avenue of live oak trees on Spring Island in South Carolina. The residents in this community have access to one of the most beautiful locations in the state, with large homes resting gracefully on isolated plots in a densely forested landscape. 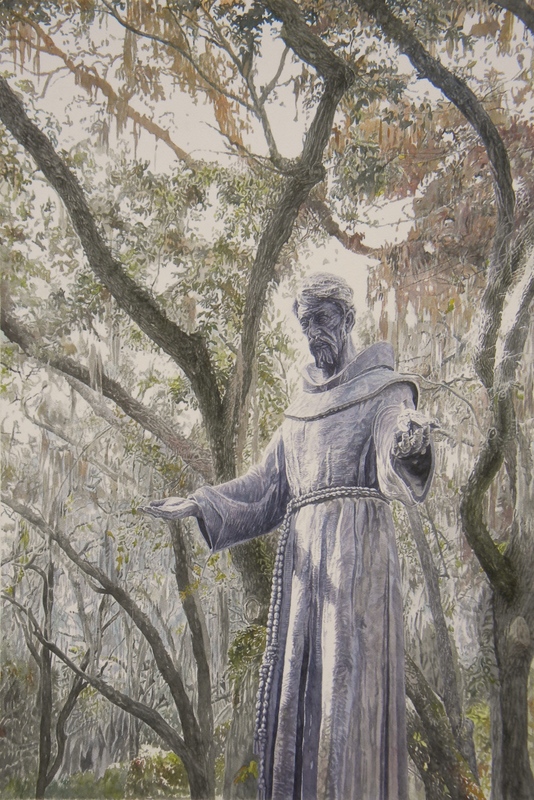 A low wall surrounds the statue, which I took pains to remove in the painting, in order to enhance the feeling of isolation and majesty in a wooded cathedral of forest. It was a considerable challenge adding colour where none existed as the entire scene was photographed in the early morning light of muted blue and grey tones.